Is Authentic Authorship Better? Why? While the article is the source of very interesting information, it is also a clue to the source of information overload children of the next generation will experience. Participation in Collective Painting Experience. The 60s & 70s Peace & Freedom – Where did the sentiment go? Great writers of the 60s and 70s have not yet been fully appreciated. Boal, Freire and writers of this kind were popular for a time. Their philosophies became appropriated. The underlying concern for the right of each individual to have, and to tell, their story was watered down over a period of time. Much of what is now on offer is packaged and entertaining. Although the ideas were hard hitting for a time they often dissipate once the show is over. In Brisbane Peter Westoby continues the work of community praxis. His story is featured in Global Citizens Creative Arts text. Colin Peile has written The Creative Paradigm and it remains a hallmark text here in Brisbane. The overarching idea of Global Citizen is to provide a framework so that each child no matter who they are or where they are from can experience their own story authentically whilst still remaining able to see their story within a larger context. This is trickier than it may at first seem. That is why it has taken so long to set up this blog and to explain Jacobs Process. Each building block has had to be fashioned, crafted and explained whist at the same time finding a way to fit the frame work together. Global Citizens Creative Arts Text acts like the baseboard for a Lego construction. It behaves like the frame of a jigsaw. in such a way that teachers can begin using the lesson ideas immediately and explore the framework further if they like the way their class responds to the feeling of full inclusion and affirmation. are combined with the power of modern technology and social media to create a fully inclusive and humane environment. The motto of this environment is Seek First to Respect : Then to Understand. 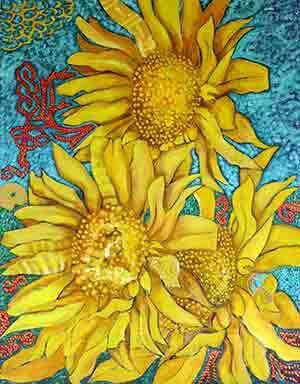 The jigsaw of the day Sunflower Jigsaw Puzzle is cut from a painting painted by a group at an Exhibition at Australian Catholic University. The painted was painted by participants who came to the exhibition it is just one example of participatory artistic endeavour. Phillips,A. (2012)A Creator’s Guide to Transmedia Storytelling.McGraw HIll. This entry was posted in 60's 70's Creativity Revolution, audience viewer, creative arts leadership, integration, Jacobs Process, learning styles and tagged queen of a parking lot on 15/06/2013 by Jo Murphy.